BEST facilitators have been delivering charity bike build events for over 20 years. After going high-tech in 2012, we continue to pioneer the future of this CSR donation program with the use of our proprietary apps and Apple iPads®. This worthwhile program incorporates engaging audio/video clues as well as fun challenges and activities. After a fun icebreaker to get everyone “in gear”, your teams will receive their iPads. Points rewarded help teams earn a bike and parts necessary from the "bike shop" to assemble the bikes for children in need. Once the bikes are built, they are inspected by for safety and displayed with the participants for a group picture. Based on the timeframe and available space, the program may also include personal notes of encouragement, a bike parade, decorative bike license plates, or a bike race. At the conclusion of the program, whenever possible, your group will present these beautiful, finished bicycles to deserving children - accompanied by a local charity representative who will address your group and thank you for your donation. Bike Build Donation® is one of our most popular give-back programs, and every bicycle your group builds comes with a helmet and a lock for safety. A variety of skills including organization, delegation, communication, and some mechanical will be used to complete this activity. We now offer two new versions of our popular Bike Build Donation. TRICYCLES for young children ages 1 to 5 years old and 26” CRUISERS for teens ages 13 and up. To ensure a great experience, aspects of this event may be modified for your group size, group makeup, time available, and other variables. 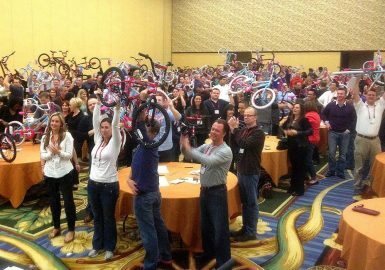 Bike Build Donation® is a registered trademark of Best Corporate Events. 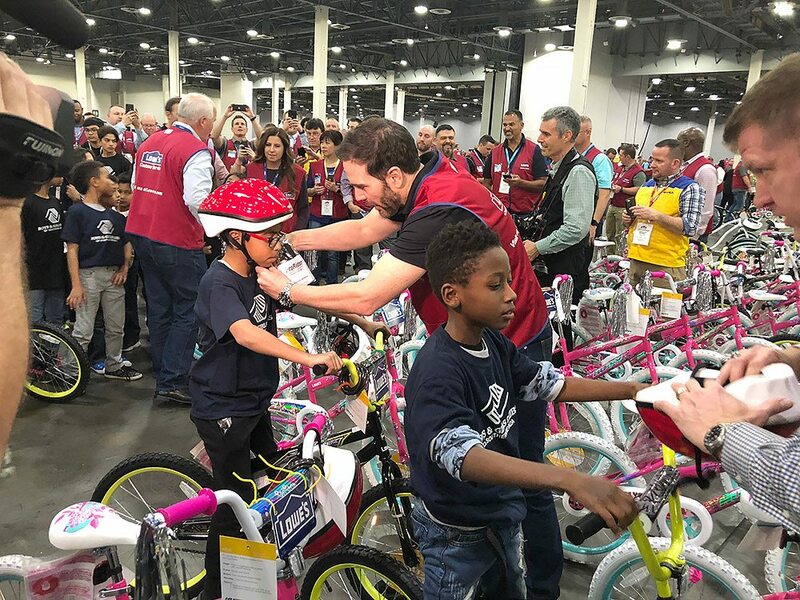 It was a great day for the 3,500 Lowe’s managers that participated in the Bike Build Donation event on February 7, 2018, at the Sand's Expo and Convention Center in Las Vegas. 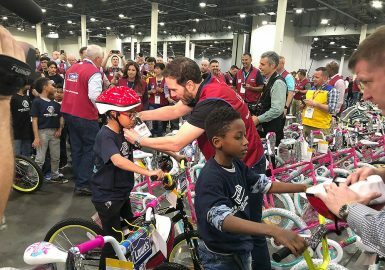 They set the World Record by building and donating 1,048 bike, helmets, and locks to deserving children throughout the state of Nevada. 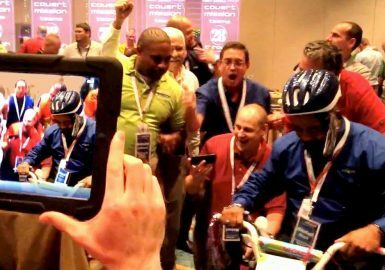 The Bike Build Donation experience with iPads has been deemed by many of the participants as one of the best charitable activities we’ve engaged in over 6 years & 12+ events. There was a perfect combination of required teamwork, creativity & of course- the experience of seeing the kids who became recipients of the bikes themselves. Since Cisco Systems is a high tech company, the iPad challenges were right up our alley. Finally- our event lead was incredible. Thanks again! Thank you again from the bottom of my heart for such an amazing Bike Build Donation event last week. Jane and I were thrilled with the response from our finance team. You were amazing, your crew was great, and everything was perfect. Thank you for executing so flawlessly. I wanted to let you know that I did a post in our internal admin group highly recommending our teams get more involved in community service types of off-sites that show our impact and called out Best Corporate Events! Many, many thanks! Thank you so much for our event. I was expecting it would go well but the outcome was outstanding. This is a tough group but you had them in the palm of your hand from the warm up games, the build off, to the children coming in to collect their bikes. We couldn’t have asked for a better event coordinator. Our group has not stopped talking about it. This charitable event has meant so much to everyone. I will be telling everyone about Best Corporate Events and will definitely be using your company again in the future. 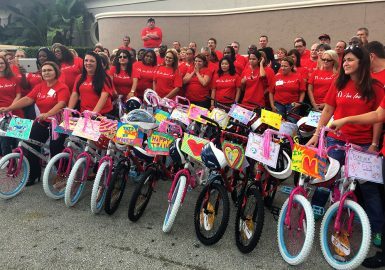 I wanted to send you an email and tell you what a great time we had yesterday at our Bike Build Donation event in Orlando. The comments from our staff were all very positive. Your lead facilitator was great; he was able to control our very competitive group, while making it fun for everybody. Again, thank you for everything and please extend our thanks to your entire staff. The Bike Build Donation event with iPads was a huge hit! Everyone had a fantastic time and the donation at the end with the children accepting the bikes was the icing on the cake. The entire team had no idea that was taking place…some teary eyes looking around the room. The bike building was fast moving, fun and a learning experience amongst the team members. Your lead facilitator did a fantastic job! Thank you! Our Bike Build Donation event was great! Everyone enjoyed it. The program went very well and your lead was a great facilitator. The icing on the top was having the kids from the Boys & Girls Club come in to pick up the bikes. Thanks! The kids are beyond ecstatic with their new bikes! They all have come to me wanting me to thank you again for the wonderful celebration and community impact. This is the first bike for many of them and some may not even of had this opportunity if it weren’t for you and your organization. They all made it to school on time the next day (although they were hoping to put in more time on the pedals) and we made it to the hotel to pick up the remaining bikes. Thank you so much for the pictures and making a lifelong impact on our young members’ lives. YOU ARE AWESOME!!!!! Taking a step back from the bike building, I looked around to see all of the teams collaborating and working together, which was amazing to see. We had fun building the bikes, completing the tasks, and seeing the impact on the Boys and Girls Club. I received a lot of compliments on the team building activity and your lead did an amazing job as coordinator and emcee of the event. 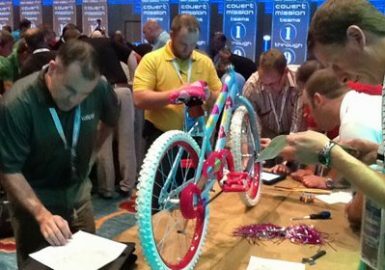 The Bike Build was wonderful from start to finish and the participants LOVED it. Your facilitator made it so fun and interactive and of course the grand finale of having the kids arrive to accept the bikes was powerful. Tears and goose bumps! Thanks again and we look forward to partnering with you again! Thank you for sending the photos of our Bike Build with iPads event. We have enjoyed looking at them again. Also, I would like to thank you and your team at Best Corporate Events for a wonderful event. Everyone was easy to work with, and incredibly helpful. I would suggest your services to others in the future. I want to thank you and Best Corporate Events for a wonderful event. Our group had an excellent time collaborating together to build the bicycles for our charity. Your team is amazing!!! Thanks for the prompt follow-up with the photos/video link from the Best Corporate event last night. Our hearts are overflowing with gratitude to you and the dynamic team leaders for allowing the AVAD team to join hands with Best Corporate events on this momentous Team Building experience. Our heartstrings will forever be connected to this Team Building / Charity experience. On behalf of “TEAM AVAD”…Thank you!!! Thank you so much for your enthusiastic, energetic, and perfect facilitation of our Bike Build with iPads. The employees of SHRM, the Society for Human Resource Management wanted to do a community service event and this was perfect. We had great reviews and the team loved it. I look forward to working with you again. 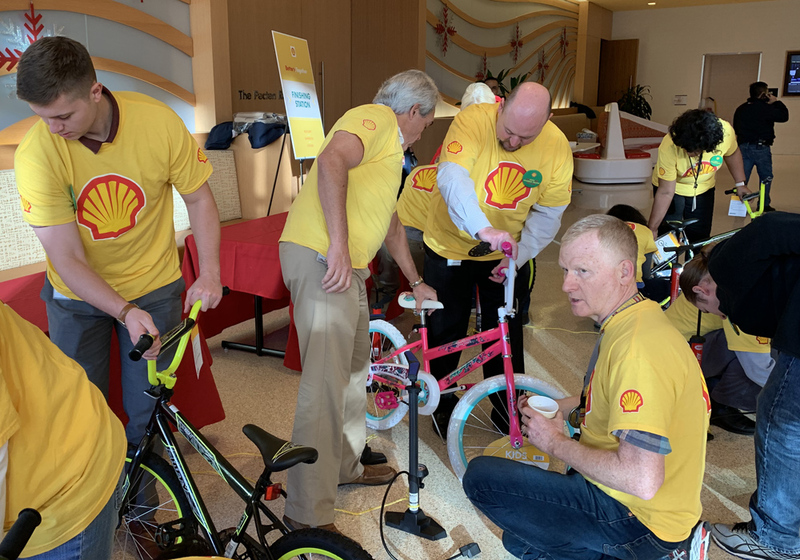 We all had such a wonderful time at our Bike Build Donation event – your lead facilitator was great and the entire teambuilding activity ran like a clock! I am receiving more and more emails telling me how much they loved the activity! Such an uplifting event and it left everyone in a great mood. Thanks very much! Thank you for all of your hard work and tireless effort to insure that our Mega bike build was highly successful! Your lead facilitator did an amazing job! Feedback I heard was “this was the best Mega break-out session over the past nine years!” Everyone really liked the pace and the multiple tasks and the materials helped everyone to focus. It was fun, engaging and challenging and all of the planning paid off. Of course the children receiving the bikes at the end was incredibly special – I appreciate your efforts in working with United Way to make this happen. Thank you again for a truly memorable event! I wanted to pass along the wonderful feedback that I received from our Bike Build Donation event. Everyone loved it and had a wonderful time and they are getting a kick out of the pictures they took on the iPads! Many people have asked for the company information so they have it available when they want to do something like this in the future. Thanks for being so great to work with and putting on an awesome event! Omg!! I don't think I can fully explain how much this program brought our company together, built long lasting employee ties to each other and the company, and paved the way for strengthening and securing the values at Seco. Employees laughed, competed, build friendships, got to know executives and laughed some more. Your lead was an amazing facilitator, keeping 330 antsy salespeople engaged, entertained, and motivated. We have participated in many different fun programs in the past, but the response from this one was far beyond expectations. Employees had a lovely time but were bought to tears when the children from the charity organization arrived unannounced. One exec scheduled to retire next month pulled me aside and thanked the team for helping him leave on such a high note. Thank you, thank you, thank you!!!!! Just wanted to say thank you for a great event yesterday. The team has a lot of fun and just seeing the look on the kids’ faces made it all worthwhile. Thank you again for a great event!!!! Our Bike Build Donation went better than we could have expected. I received great feedback from our team. Many said it was the best team build they ever participated in at our company or any other company they worked at. Your lead facilitator did a great job - he was awesome. He has a great personality and it definitely made the event a great experience. Thanks! It was fantastic! Everyone had nothing but positive comments. Both in the games and the giveaway to the kids. Bradley and his assistant were so much fun and engaging. I will definitely tell my associates about you guys. Thanks again for a perfect team building event. We felt so privileged and honored to take part in your new Bike Build program. We couldn’t stop talking about the integration of the iPads - they were a great added value! I also loved that I just booked the program and your team handled the rest. Your facilitator was a great leader- funny, personable and very excited which got everyone super motivated. My team said they would never forget it! The event was absolutely fabulous! Your lead facilitator did an amazing job. The icebreakers were just perfect! So many of the attendees mentioned how great the whole teambuilding event was – some even mentioned it multiple times!! This was truly the first time most of these people had ever met and having them work in these groups and figure out each other’s’ strengths and weaknesses was such a great exercise in itself. My team learned that no one knew how to put a bike together! So it really was a team effort for us! Lol. Thanks so much for offering such a great experience for companies like mine. I can't say enough about the Bike Build program! It was exactly the type of team building activity that we were looking for, and it was executed beautifully. Your lead facilitator and his team were great during the event -- they were able to command the attention of our group and have them work very efficiently so that they were done right on schedule. I am also very pleased that your group was able to arrange for members of the Boys & Girls Club of Pasadena to accept the bike donation - what a great ending to a great day! I also really appreciate that we received the footage and photos from the iPads so quickly! My team and I are having a great time browsing through all of the material and will be using it to provide a fun feedback from our attendees about their experience with the Bike Build Donation. My director was thrilled with how the event went, so I am thrilled too! Many thanks to you and your team for making the whole experience, from contract signing to bike building, easy and enjoyable! I wanted to take a second and say thank you for the great job you guys did at the Bike Build on Tuesday. The group had an amazing time and the added bonus of having the kids there to receive them was truly special. Thank you so much for time, effort and leadership. I look forward to working with you again. Thank you So Much for all you did to make the evening and charity bike build event such a huge success. Your facilitators were amazing and made everything run so smoothly. It was wonderful to see the guests working so well together and having such a good time making the bikes. The finale was perfect. To witness the mixed and sobering emotions at the surprise presentation to those beautiful children was something I will long remember. It really pulls at your heartstrings! Thank you all so much for a great job and the amazing experience. I just wanted to send out a HUGE thank you for a wonderful event last week. The response from the team has been fantastic! I think we will most likely do another event like this for them next year. After experiencing the group, if you can let me know what you think would be good options for them I would appreciate it. I am sure it will be hard to beat the bike build. Thanks again for everything. Our hopes are to pitch your services to many more of our clients. Thank you so very much for yesterday’s Bike Build Donation event. We had such a great time together… your lead facilitator was the best ever! One of our colleagues who joined us wants to have the same event at his U.K. facility. It has been a pleasure working with everyone at Best Corporate Events to make this wonderful event happen! We look forward to having another event sometime next year. Naoko, Sumitomo Chemical America, Inc.
Our Bike Build Donation event was a huge success! Your lead facilitator was a wonderful, funny, and engaging host … people loved the games on the IPads … building the bikes for the kids was a lot of fun but it was priceless when the kids came at the end and actually got to interact with our team! All in all an A+ experience!! Regarding our Bike Build donation event; your lead facilitator and her staff were fantastic and the donation to the children was a special moment for the entire team. Oracle Consulting will definitely be using you again in future team building events. Thanks again. I will be honest that I did not know what to expect prior to the event and had only heard great reviews. Our group had a wonderful time and it was truly rewarding knowing that the bikes were going to a local community. Fun was had by all and your facilitators were extremely helpful and made the process for me very easy. Thanks again for all your help. Joe, Arthur J. Gallagher & Co. The Bike Build Donation was amazing! The team that you sent us was phenomenal!! They truly looked excited to be there and to be working with us, and that positive attitude affected all of our guests. This is why Best Corporate Events is one of my favorite partners. Looking forward to many more future events together! Our Bike Build Donation in Menlo Park was very organized and the icebreakers were great! The most successful team building aspect was the fact that the program loosened up our team so they wound up having a great time together. They enjoyed the activities and loved the charitable aspect of the event. It was a great experience! We truly enjoyed our Bike Build Donation and working with Best Corporate Events. We will definitely keep you in mind for future events. The entire staff was friendly, energetic and an absolute pleasure to work with. A special thanks to your lead facilitator who kept it all together and was a true motivator! The best team building aspects of this program were the icebreakers, the iPad questions and challenges, and lastly, the building of the bikes. The event was very organized and presenting the bikes to the kids at the end was the most fun. Our whole group said they enjoyed the Bike Build Donation program very much. Our experience with your lead facilitator and his staff was great! Our client really enjoyed the Bike Build Donation event and we think it was a great success. Thank you! Our group loved the Bike Build Donation event, and what made it even more special was having the kids from the Boys & Girls Club here to receive the bikes. Your lead facilitator did a fantastic job! The iPad challenges were fun and the photos and video clips we took helped us remember what a great time we had. Thanks for everything! Our Bike Build event went off without a hitch, and everyone was very professional. Working together with teammates to complete challenges on the iPads was really fun. Everyone that I spoke to loved the event. They said they had a great time, and seeing the children receive their bikes really touched them. One team member described it as "exhilarating. I think the use of the iPads helped with the team building. We had to work together on a lot of the challenges to find the answers, and to take pictures and video. The event was very organized from the planning phase to execution. Your facilitators did a great job keeping everything in order and the bike races after the teams finished building was really fun! We loved the fact that there is a charitable component to the event. 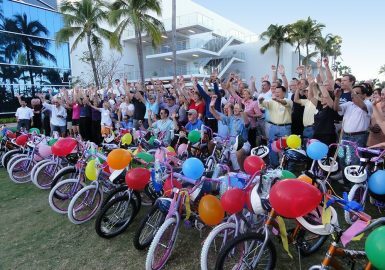 Our company puts giving back first in all we do and having the Boys and Girls clubs there to accept the bikes was the icing on the cake. We are very grateful for the event and believe it was a highlight of our celebration weekend. It gave everyone a chance to really get to know each other and do something fun! Yesterday went off without a hitch. The Bike Build Donation went smoothly and the participants loved the activity. Your associates were professional, personable, and very hard working. Thank you for everything. Everything was OUTSTANDING!!! Your team really did an awesome job with our Bike Build Donation and I think quite a few referrals will be coming your way! Thank you for yesterday’s Bike Build Donation session. Your lead facilitator was wonderful and we got some really positive feedback. He managed the time and made it so fun! The entire group joined in and was so enthusiastic about building the bikes. The representative from the Boys & Girls Harlem Club was great and so were the kids. Thank you very much! We were nervous about this program because this was a huge leap from anything we had done in the past but your facilitators delivered a home run. Our group responded to the competitive aspect of the bike building challenge immediately. The entire program was fun for our participants. They loved the charitable aspect of the program and were emotional when the representatives came in, especially the children. The event was wonderful! We really appreciate how everything was coordinated, and the presentation by your lead facilitator was excellent – all positive feedback and even better that we were able to deliver the bikes in person to the children. Very positive feedback by all of the participants and we hope to partner with you guys in 2016 on some other team building events! We had a great time and really enjoyed our Bike Build Donation event. Your lead facilitators did a nice job to keep us on track and we appreciated that. They were both professional and very self-sufficient. Thanks! The experience was awesome and your lead facilitator did a great job. I would definitely recommend the Bike Build Donation program and Best Corporate Events. On behalf of all of us at Quest Diagnostics, Thank You! For your Bike Build Donation event at MetLife Stadium on June 15. 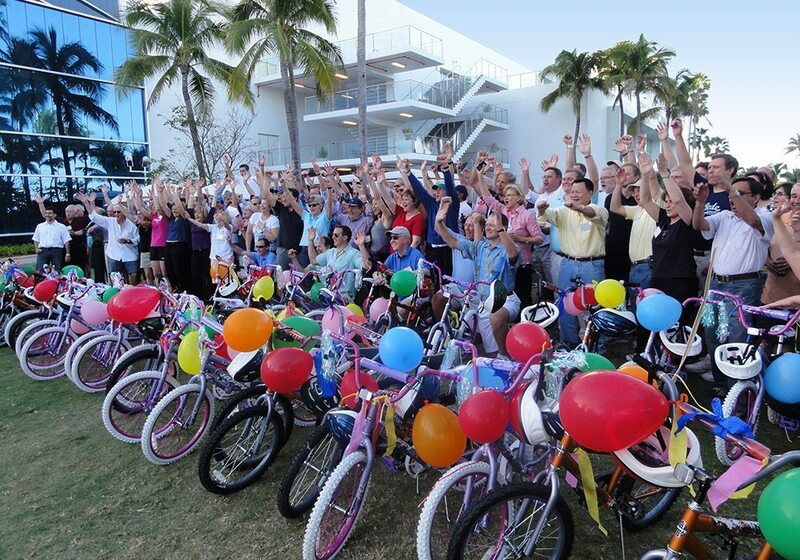 The logistics were flawless, the attendees had a great time – and most important, the kids got their bicycles. Seems you guys have this nailed down pretty well….but if you ever need a reference – just let me know. Thanks again! Just wanted to send a “Thank You” for a orchestrating a great event yesterday. Our people were excited and engaged from beginning to end. Some of our folks were sharing yesterday’s experience within other departments and they have asked for your company’s contacts and information (which we have passed along). Looking forward to receiving the photos and videos from the Ipads to share with the team in our next meeting. Thank you again and we look forward to working with Best Corporate Events again! Your lead facilitator and his team did amazing delivering our Bike Build Donation with iPads. And were very willing and helpful with adjusting the time we needed for the event. Thanks! Your team at Best Corporate Events was extremely responsive. Our Bike Build donation program was fun and very well organized. Our group found all the activities very enjoyable and wouldn’t have changed a thing. Keep up the outstanding work!!! Our Bike Build Donation program was excellent! It was extremely well organized. All in all, it was a very effective and enjoyable team-building event. I have heard nothing but positive comments about our Bike Build Donation! Everyone really enjoyed the activities and thought your lead facilitator did an amazing job!! The best “team building” aspect of the program was the iPad games/questions that required the group to work as a team. Giving the bikes to the Boys and Girls from the Boys and Girls Club was great fun!! What I liked best about our Bike Build Donation event was the enthusiasm of the facilitator. He was very fun and energetic and made sure everyone had a great time. I don't think there was anything I would change about this event. I think this was a great experience for our company and truly hope that we have the opportunity to work with your company again in the future. Our Bike Build Donation program was extremely well organized. The best team building part was trying to collectively come up with the correct answers to the questions on the iPads. The most fun was riding the bikes at the end. As a whole, our group really enjoyed the activities. Great event! We had an absolute blast!!! It was a bonding experience and we all had so much fun! We loved the fact that one of our owners got on a bike and all of my staff got the biggest kick out of seeing him compete in the relay race. We do a sales summit every year. I am sure you will be hearing from me again. Thanks again for everything!!! Our Bike Build Donation was thoroughly successful. It was a great team building program in every respect. It got rave reviews and created lots of laugher too. Your lead facilitator was awesome! Now, we want to come back and do something different...we'll be in touch! The best team building aspect of our Bike Build Donation program was the interaction between the groups while collecting points. The entire event was fun and our group loved it. It was a great time and a great experience. Our Bike Build Donation event was organized so well! We had a tight timeframe and your lead facilitator did a great job getting 180 people organized. The best team building aspect of the program was the charity portion and the iPad challenges are the most fun. We LOVED the charitable aspect of the program and seeing the kids was amazing. Your lead facilitator was wonderful and it was so great that your company did everything! The entire event was amazing, and the link you gave us to our entire Bike Build Donation program with slide show, pictures and video was awesome. I laughed after watching everything…it certainly was a hot topic at dinner. It was a totally awesome feel good event that gave back to the local community and the guys really felt good after doing the exercise. The charity has already expressed how wonderful the donation was to receive. I am sure this will not be the last you have heard from Morton Salt. The challenges were fun and your facilitators were a pleasure to work with. Our group enjoyed it quite a bit and said they preferred it over other team building events we have had in the past. The Bike Build Donation was very well organized and we had great communication leading up to event with our coordinator from Best Corporate Events. Having each team work together to build their bikes was a great way to have people work together that don't normally do so. All of our teams enjoyed the activities and questions on the iPad. 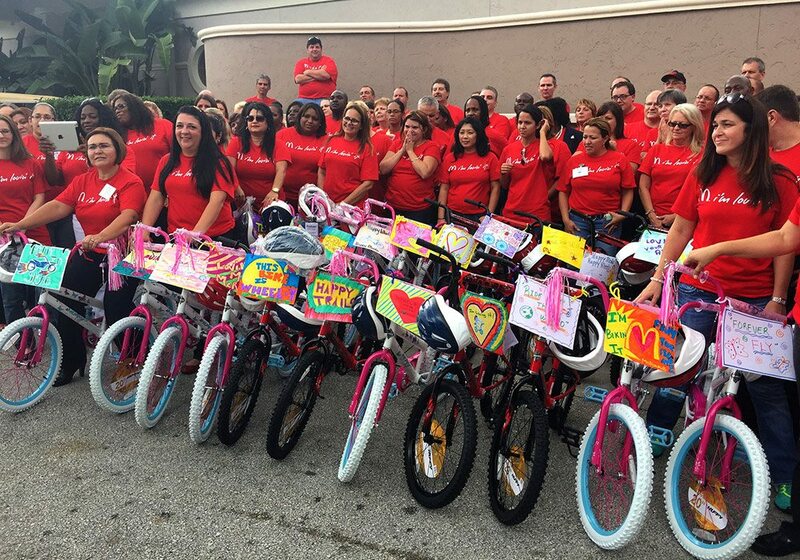 Our company thoroughly enjoyed the opportunity to give back to our community with the bike build. We had a wonderful event and will look forward to booking our next team building event with Best Corporate Events. Your Bike Build Donation was perfect! The warm-up activities that your lead facilitator did really got the group engaged and in the right frame of mind to work together on the bikes. It set the tone for the program! The most fun was giving the bikes to the charity - some attendees even teared up! Everyone seemed to have a great time building the bikes and hearing from the charity they were donated to. Your lead facilitator was amazing! He made the event great! Our Bike Build Donation was a very organized event. The best team building aspects of the program and the most fun were the iPad activities and the actual bike building. Your lead facilitator was really great through the whole process and the feedback from our group has all been positive. Our group at Cisco felt that this was one of the best teambuilding events they had ever attended. They mentioned that sometimes these programs can be a little corny, but this was really great, especially the team building involved in doing the iPad challenges as a team. Aside from the competitive aspect, as we are a very competitive group, our group really enjoyed meeting the Boys & Girls Club representatives and understanding who was getting the bikes. Your lead facilitator did an absolutely fantastic job!! Your team did a FANTASTIC job at our Bike Build event in Chantilly last week! I’ve heard sooooo many staff raving about how much they LOVED your event…and your lead facilitator’s uplifting, FUN personality and ENERGY! THANKS so much for making it such a success! Wishing you a GREAT rest of 2017 and beyond and we look forward to contracting with Best Corporate Events again in the future! This was one of the best events we’ve ever done! It was very organized and every activity was a great team builder. Our group enjoyed all of it and the fact that your lead facilitator told her personal story and related it back to everything. The entire event was fun and the team enjoyed it from start to finish. They loved it! Everyone was really intent on making the bikes as best they could and were very touched and moved once they found out what was happening with the bikes. The icebreaking activities were really fun and building the bikes as teams with every team member taking on a different role was a great team builder. Your lead facilitator was very infectious and did a wonderful job! Your lead facilitator was very organized and able to be flexible with the program to meet our time commitment. The entire Bike Build Donation program was fun. Our group loved it and the facilitators were awesome. I had some of the leaders state they were going to book your events for their teams. The activities were great to get everyone better acquainted - but the children coming to accept the bikes was the best. The most fun were the iPad challenges. The overall coordination was great - especially with your staff who setup the charitable giving, even after the first recipient had to back out – they were great with follow-up. Our group loved it - nothing but positive feedback. I liked how your lead facilitator got us all engaged in our Bike Build Donation program. Everyone really enjoyed working together on the iPad challenges and building the bikes. The most fun was the bike races at the end of the event. We had a great time – thanks! Our Bike Build Donation program was fun and accomplished what we were looking for in such an event. Our group enjoyed the activities and the charitable aspect of the program. We really had fun building the bikes for the kids and your lead facilitator was a great leader during the event. We really enjoyed the opening icebreaker at our Bike Build program. The activities were fun, as was racing the bikes, and the charitable aspect was superb. It fit our corporate values very well, and everyone was happy to contribute. Thank you for making something like this available for corporate events. It means a lot to be able to have fun as a team and also give back. The best team building aspect of our Bike Build Donation program was the iPad tasks and challenges. The most fun was the “marketing the bikes” segment where each team had to deliver a fun 60-second commercial as if they are a bike company and trying to win a lucrative contract. Everyone loved it and we had a blast!! Your lead facilitator was perfect for our group. I'm so glad I found your company. Our group had a great time during the Bike Build Donation and really appreciated being able to give back to the Boys and Girls Club. The best team building aspect was the great interaction during the bike build and the different tasks we needed to accomplish to get points on the iPads were really fun. It was a very organized event. We got the link you sent of the photos and video from our event. 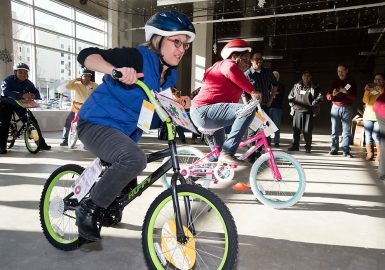 The Bike Build Donation event was fun. The event worked out really well, and we appreciate how your lead facilitator drove engagement and ultimately a great community service event for us. Thank you so much! Everyone I dealt with at Best Corporate Events was friendly, responsive and eager to help. Your lead facilitator who ran our event was absolutely outstanding. He was funny and witty and got everyone involved and interested in what we were doing. Our group enjoyed all the activities and they were very happy to do a team building activity where they could donate the end product to charity. We couldn't have asked for more. Marianne, Merck & Co., Inc.
From start to finish, the fun icebreaker and multiple activities to earn points created a lot of excitement and laughs while working together to achieve a mutual goal. Our group enjoyed the activities and thought the charitable aspect of the program was excellent. I would highly recommend this program! Our client and the entire Solomon & Associates team were thrilled with the Bike Build Donation program and the enthusiastic participation of ALL attendees! It was such a pleasure working with the Best Corporate Events team. From the beginning, we knew we were in good hands and felt the pre-event process was very organized (and easy!) Thank you so much for sending these photos and videos! They are a true testament to the fun that was had last evening. We hope to collaborate with you again in the future for another fun event! Just wanted to send this quick note of thanks. The team at Flex Atlanta thoroughly enjoyed the Bike Build Donation team building activity on Tuesday. Not only was it a good bonding experience, everyone felt inspired to do something good for the community. The event exceeded my every expectation; excellent job hosting as well. Thanks again for your help. Your lead facilitator got the ENTIRE crowd involved. We were unsure if everyone would participate in the Bike Build Donation but they all joined in the fun. The teams quickly began to work together on their challenges and loved the little videos they had to make. They really enjoyed the charitable aspect of the program. I recall seeing multiple grown men on little children's bikes zooming across the lawn to the supply table. The group was really engaged and loved that they got to hear back from the Boys and Girls Club about the recipients. We loved our lead facilitator! He and his entire team were wonderful. He arrived early, was very organized and wrangled the group that was more interested in cocktail and food than the activity. THANK YOU! This is one of the best team building events I've ever attended! I want to thank the team at Best Corporate Event for delivering such an AWESOME event! All the teams had an incredible time – and your facilitator did an excellent job! The interaction with the facilitator and the fun activities on the iPad were the best team building aspects of the program. The entire event was fun! The teams loved the challenges and activities on the iPad. The activities kept the teams engaged and having fun. The charitable aspect of the program is the primary reason we wanted to host the event. It was very impactful to everyone. Great job! I will definitely be contacting you again next year! Thanks again! Unbelievable! We've had more amazing feedback about this event and "giving back" than we have for any other team event we've had. It was great having everyone come together - we put people together on teams who normally don't work with each other day-to-day and it was great to see everyone come together! We have a very competitive group and it was great fun watching grown adults race for the win! Very much appreciate the organization - it was so nice to have much of the weight of planning and pulling off an event lifted. Your facilitator did a fabulous job with our Bike Build Donation! He worked really well with his assistant and the team talked about the experience days after. They loved the icebreaker and building the bikes. It was great watching the teams work together. The charity showed up and brought kids from their program. They were able to eat with us and watch the fun. It was fabulous! Our Bike Build Donation with iPads was extremely organized. The best team building aspect of the program was the iPad trivia and team challenges. The most fun was taking the photos and videos. The feedback was very positive. Everyone I spoke with was very excited to be part of a charitable event and hearing the personal stories from the charity representative. We did the bike build for charity. I will admit when our group found out what it was, they were thinking it would be boring, but, they all loved it! The whole thing was fantastic and we had a terrific time. Your lead facilitator was phenomenal and the charity aspect touched everyone. We loved the icebreakers with the group, several of which we had never seen before and we found them to be very interesting and engaging. Watching the adults ride the bikes for "quality control" and the joy on the adults' faces was fun, which we hope mirrors the joy the recipients (children) will experience with the bikes. Our group thoroughly enjoyed the activities and charitable aspect of the program. Keep doing what you're doing. Our Bike Build Donation program was the best company event that we have ever had. Your lead facilitator did a great job! I could not have asked for it to go any better or for our employees to react any better. Thank you for your efforts. The best team building part of our Bike Build Donation was building the actual bike, which was energetic, fun, chaotic and energizing. The most fun was the activities to open the event and the activities to earn the points. We have scores from our own evaluation that we can share. They really liked it. I have used Best Corporate Event for a couple of events and the facilitators are on spot, very energetic and get the group relaxed and having a good time. The activities and charitable aspect of the Bike Build Donation program was a big hit with the group. They loved being able to team build and at the same time give back to the community. I think the icebreaker interaction with group and the children being able to be on site to get their bikes was a huge plus. Your lead facilitator arrived early, was well organized and had a great personality. He was able to keep the attention of all the participants. The iPad was a great feature and each group enjoyed capturing the event with pictures and videos. This was a competitive group -- each team really wanted 1st place! It was nice to see the bikes go to a local organization and have the local organization onsite to receive the bikes. Our group really enjoyed their Bike Build Donation. On behalf of the entire Solomon & Associates team, THANK YOU! The Bike Build Donation event you facilitated in New Haven this week was wildly successful and our client was so happy with the outcome. We cherish our partnership with Best Corporate Events and truly value you as a vendor that we can trust and count on to deliver. I have enjoyed every part of working with you. Your facilitation of the activity energized the group after a long day of meetings, not an easy task! Thanks again for such a successful program! The best team building aspect of our program was the iPad questions and challenges. It was a very organized event. The most fun was the presentation of the bikes to the charity. Our group enjoyed the activities and charitable aspect of the program very much. We got lots of positive feedback from the participants! Brian, East Coast Risk Management, Inc. I wanted to extend our gratitude again and let you all know that your gift of these bikes will be of great impact this holiday season. I hope that the team at Children's Hospitals could see and feel the joy in our children last night along with that of each team member from the Y and the Boys and Girls Club. This kindness is contagious and will make for lifelong impacts and memories on both sides. We, from the Y, are grateful for your kindness! With appreciation and in solidarity. The actual building of the bicycles was the best “team building” aspect of our Bike Build Donation event. The most fun was the bike race, a great addition to the program. Your lead facilitator did a great job! Loved seeing everyone help load the truck with the bikes at the end of the program. We hired your company to deliver two nights of back-to-back Bike Build Donation events for my organization. They were amazing and both groups had a great time. Thank you for what you do. Your lead facilitator was amazing and if I personally host another event with your organization, I want him again as the facilitator. Our group enjoyed the activities and loved the charitable aspect of the program. The entire experience was fantastic! Thank you so much for all of your help during the planning and executing of this weeks event! It was an absolute pleasure to work with you and I hope to have the opportunity to do so again in the near future. Our client had nothing but great things to say. I also wanted to say how amazing it was to work with your facilitators – they were great! Their energy made for a successful event! I wanted to THANK YOU ALL again from the bottom of our hearts for all the support and gifts you have given to our children and to the entire community. Since receiving the bikes, we have had two separate raffles during our Homework Help class where we draw one child’s name from each grade, 1st through 5th, who have been showing up for homework time. I am thrilled to say that our kids look forward to doing their homework because they are now more motivated and encourage to study with us. Without these bikes, we would not have been able to give them each this awesome reward! THANK YOU and your client, Alert Logic, for everything! Your lead facilitator did an excellent job of bringing the team together from the beginning of the event until the end. It was overall a very positive, team building experience that everyone enjoyed very much. The friendly competition throughout the event was the most fun. The entire team was thrilled that our organization was giving back to a local charity. We have done food drives and donation drives in the past but having the ability to play a key part in putting the bikes together allowed them to feel more involved in providing the support. I have heard nothing but great feedback from the team regarding the event! I just wanted to tell you that your lead facilitator did an absolutely OUTSTANDING job yesterday. He was there early, had the tables prepped before going in, and thoroughly captivated the crowd and had their 100% attention from the start. The children were a little bit delayed due to the traffic, but he held the attention of the team until the kids arrived. He did a great job of including the client exec team (who were not part of the build teams) in the process. It was another very successful event with a very happy and satisfied client – as well as some very, very happy children. Thank you. We enjoyed the event to the max and we are so grateful for the experience it brought to each one of us. The best team building aspect of our Bike build Donation was everyone working towards the main goal, unity, and lots of teamwork! Seeing how all bikes turned out, decorated was amazing. I truly felt very loved and supported by the entire groups of teams! I wanted to thank you so very much for such excellent facilitation of a great event. Everyone had a great time at the Bike Build Donation program, and I’ve had many people reaching out with gratitude for the experience. It also looks like we will follow up with ABCD for more opportunities to work with them, so I’m glad that the bridge was created! Thank you again, and have a wonderful weekend! Elana, Halloran Consulting Group, Inc. This was Hands Down one of the best events ever. I want to pass along a note of praise for the Bike Build Donation program and your lead facilitator who was super energetic and funny. We had the best time at this event and a huge part of it was because of him. Thank you! The energy and true teambuilding spirit that came from this event were amazing. The entire program was fun from start to finish! Most important, were the children receiving their bikes. Words cannot express how truly delightful that was for all of them. Your lead facilitator did a great job! He brought energy, although our teams had much of that as well, from our program. Your entire team involved in our program were amazing and truly an asset to your company. We cannot thank them enough! The opening icebreakers at our Bike Build Donation event were great. Mixing up the participants to work together was the best team building aspect of the program and watching the kids getting their bikes was the most fun. The event was extremely organized and everything we anticipated. We enjoyed the experience and look forward to working together again. Our Bike Build Donation was extremely organized. The best part of the program was the fun icebreaker to get everyone comfortable and geared up for a great afternoon. The most fun was watching the teams interact with one another and doing something charitable for the community. Our group LOVED the event! The icebreaker games really got things off to a good start and the competitiveness of a race to build the bikes also brought people together working as a team. The entire program was fun. The charitable aspect allowed people to break out of their comfort zone to participate in some of the funny things they were required to do to get points. Your facilitator was super! He was engaging and inspiring. It was apparent he loved what he was doing. We also wanted to try and reduce the amount of time for the entire event as we were working within a tighter timeframe than originally thought. He did an excellent job at moving everything forward in a professional manner. Having the opportunity to build these bikes for kids was the best team building aspect of the program. Our group really enjoyed the activities and charitable aspect of their Bike Build. The icebreaker was the most fun and your lead was very knowledgeable. The iPad challenges were great and next time our group wants to do a SmartHunt. Your lead facilitator started the program with an activity where, as a team, we had to figure out how each of our pieces of a picture connected to the rest of the groups. It was great at showing how important communication and networking can be. I haven't gotten the official feedback from our survey, but every person that came up to me, commented on how moving the experience was for them. The most fun was seeing the faces of the kids when they got their bikes! This is a great event! Our Bike Build Donation was perfectly organized and fun. The team building involved in the iPad quizzes and challenges throughout the program was a great way to see the teams in action. The most fun was watching the competition between teams. Our entire group said they really had a great time. The icebreaker got everyone excited and warmed up to build their bikes. They very much enjoyed building the bikes and playing the trivia game. As a bystander, I enjoyed watching them create shapes to answer questions, sing and hop like a bunny. The entire evening was fun! I would highly recommend this event and the great facilitation made my job easy! Our Bike Build Donation was such a cool and fun experience, and it was great helping out the children in the community. Your facilitator was very high energy and helpful. The most fun was the building of the bikes, the team cheers, and taking all of the pictures and videos on the iPads. Our group loved it! This was definitely one of the coolest company events I have ever participated in and I certainly had a great time meeting people I have just seen around the campus. Your lead facilitator was awesome! He was very professional and fun. The Bike Build Donation activities were fun to do, especially the iPad trivia, and the thought of the huge smiles on some kids’ faces is just priceless. My group thought this was the best team-building program they have ever done. Our facilitator was awesome, had a great sense of humor, and made the whole event fun. My team especially liked that we received a picture of the boys who received the bikes. The most fun was judging the team cheers. There was not one best team bonding activity because the entire program was fantastic for team building. On behalf of all of us at Boston Scientific, I want to thank each of you for making this day an amazing event. Your lead was an excellent host and got the team involved from the very first minute and we are so thankful for his leadership throughout this fun activity. Listening to Maurice from the YMCA speak about the kids and the impact the YMCA has on their lives was truly remarkable. Keep making a difference each and every day and you will change lives both in the short term, but more importantly in the long term. Lastly, the kids you brought were amazing young people. It was tough to say goodbye, but I do hope we stay in contact as we want to learn more about how they are doing. What a great day, we are lucky to be a part of it. Thank you. Those words clearly cannot convey exactly what we mean, but trust that this event was better than we could have ever expected. So again, thank you! I really liked being able to ask Best Corporate Events to help us out because they took the event to the next level. They brought the pep and the music and the awards to get people motivated to want to win and do well at this activity. This event was fun - something different than sitting in a meeting room all day. Our group loved the activities and really loved the charitable aspect as it made the entire event worth it. Your lead was a great facilitator and held his own with all the questions he received throughout the event. It was awesome and I hope we get to work with BEST on another event again soon! Our Bike Build Donation was extremely organized. Our group highly enjoyed the activity. Some employees even asked for your company information for their friends at other companies. Building the bikes and having it be a competition with the other teams was the most fun. Your facilitator was amazing; he was able to get the group to come together. From start to finish, working with your organization was very easy and organized. Your "entourage" icebreaker was a blast and got everyone very fired up for the event! We've been receiving countless comments about how much fun everyone had during this activity. Our group had a lot of fun during the activities in our Bike Build Donation program, but they absolutely loved the charitable aspect. Your lead facilitator did a great job with our rowdy group! He was fun, but to the point and kept everyone on task, on time and organized. Many individuals told me it was the best team-building event yet and were very moved by our receiving organization contact’s Juan's speech at the end of the program; some were even brought to tears. Thank you so much to your team for a memorable experience for all of our associates! Good morning, everyone. I wanted to take a few minutes to thank all of you for putting together a fantastic program for SKH University 2019 on February 27. I don't think I've ever seen this audience so engaged. People were still buzzing about it the next day. Even some of our quieter, normally less enthusiastic participants were completely engaged in the activities. Our feedback form was sent out yesterday, so responses are still coming in, but it was definitely a home run. Let me know if you'd like me to share the final feedback report. All in all, a fabulous day. Feel free to use me as a reference for companies considering this event. The greatest part of the event was the moment the children walked into the room to accept the bikes. The competitive component was fun too. We had about 7 different group activities throughout our 4-day conference. This one was everyone's favorite. They loved the charitable aspect of it. Our facilitator was super organized but also very charismatic. He was great with the crowd, confident, and executed the event from start to finish covering every detail - I didn't have to do a thing! Thank you! This was an incredible experience for us. Both fun and a great way for the group to work with each other in a competitive setting for a good cause. The best part of the team building was Building the Bikes. The most fun was having everyone feel accomplished after completing the builds. The group really enjoyed it and felt they were helping our veterans and their families. Great organization and partnerships. Pricing varies depending upon the number of participants (minimum of 30) and includes Huffy® bicycles, helmets and locks, the team building program, prep, production coordination and all materials, program design, a professional lead facilitator and staffing.